If you think of some famous singers you’re familiar with, you probably associate them with wealth, status, travel, and, of course, their fans. If ever there was a profession that could “feed the ego,” it’s singing. If and when you ever get the chance to have 20,000 people chanting/screaming your name while you’re on stage, you know that the feeling of fame can be exhilarating and intoxicating. For some people, getting applause is quite a high. When someone achieves great success as a singer, the rest of the world puts them on a pedestal and looks up to them. They become iconic, known for who they are, what they wear, who they love, what they sing, and more. It’s no wonder that young people pursue singing, because it can lead to a great life. Now only a select few singers can ever reach the heights of fame like, say, Lady Gaga or Michael Buble. But whether or not YOU become famous as a singer, it doesn’t really matter… singers, in general, have great lives. For starters, singers have strong hearts and lungs because they give these things a good workout. Singing uses a wide range of muscles and helps improve circulation. It can even help tone your abs! Studies have also shown that singers have better balance than most people. Next, singers are generally happy, and this is because singing helps release endorphins. Singing is a mood lifter that can calm nerves, take the stress away, and make people feel better– good, right? Finally– and this might surprise you– singers tend to have better posture and look younger than people with other hobbies and jobs! In order to breathe properly to sing properly, that requires standing up straight with shoulders back– hence, good posture. Meanwhile, singing is a form of exercise which helps people tone muscles from the stomach to the face– making them look younger. That’s a nice bonus. It’s no wonder, then, that it’s commonly thought, “Singers live great lives!” Indeed, they do. If you would like to work on becoming a better singer, learn what renowned instruction Tricia Grey can do for you. 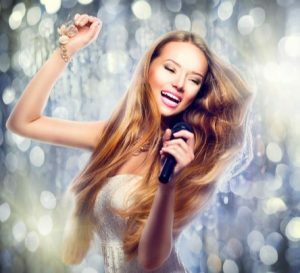 Sing Like A Star Studios offers private lessons for individuals of all ages and experience levels in East Cobb and Alpharetta, Georgia, and online. We teach lessons all over the world with our our distance lessons. To learn more about the studio and to schedule an introductory session, please register here. Our gift to you: Succeeding in Music E-book! Click here for your free E-book: Succeeding in Music! Why Don’t I Like My Recorded Voice? Can Your Teeth Affect Your Singing Voice? Get more information on voice lessons and vocal tips. © 2019 Sing Like A Star - All Rights Reserved.